All donations until January 31, 2018 will be matched dollar-for-dollar up to $20,000! Give Today! There are two options to make your gift in honor of David Grotberg today. 1. MobileCause: Just text the keyword DAVIDG to 41444. MobileCause will send you a secure link to input your contact and payment information. 2. Online: Make a contribution in David’s honor HERE. 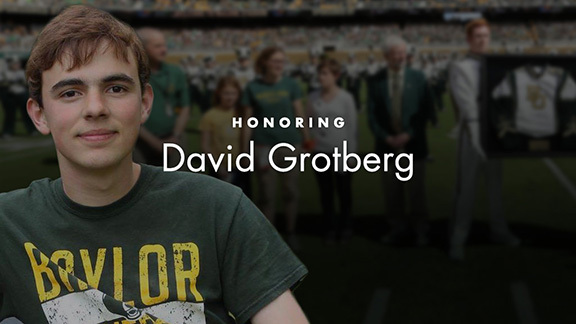 David Grotberg, a sophomore from Fergus Falls, Minnesota, was a very active and visible presence on the Baylor campus. He was involved in the Honors College as a member of the Honors Residential College community and participated in the Baylor Interdisciplinary Core, the Honors Program and the University Scholars Program. He also played trumpet as a member of the Baylor Golden Wave Marching Band, served as president of the Ballroom Dance Society, and was involved in Alliance Bible Church in Waco. "Like a lot of students in our community, David was amazingly gifted - smart, artistic, creative - but even among our students he stood out for his energy, charisma and winsomeness," said Jonathan Tran, Ph.D., faculty steward for the Honors Residential College (HRC) and associate professor of religion. "He was surely one of our brightest stars, loved by so many and with such a boundless future." Your contribution to the David Grotberg Endowed Scholarship Fund allows future Honors College students to carry on David’s legacy within the Honors College and our residential community. David’s family will be notified of your gift to this fund.